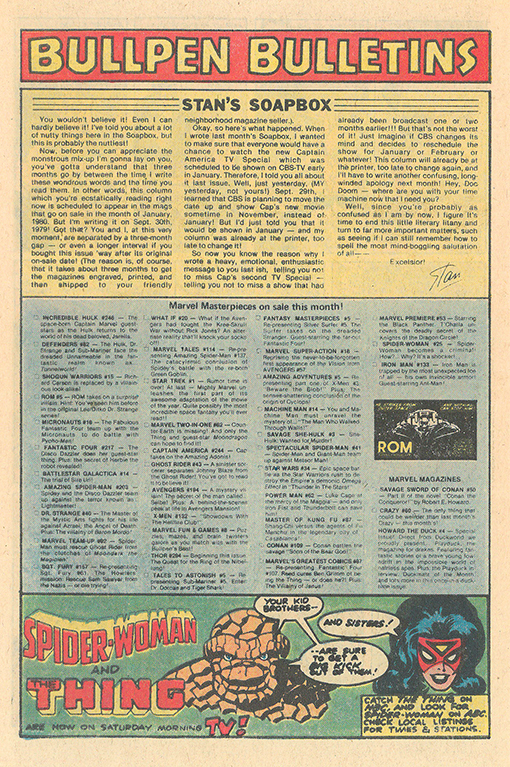 Marvel's Bullpen Bulletins page for April 1980 included Stan's Soapbox, the Mighty Marvel Checklist and a great house ad for the Spider-Woman and Thing cartoons that were airing on ABC at the time. In Stan’s Soapbox, the Man laments the challenges of writing his monthly column three months before the publication date of the comics in which its printed. As we’ve noted in past months, Stan’s monthly missives often refer to dates that have already passed or contain information that’s no longer accurate. We feel his pain since the Marvel Checklist is also filled with inaccuracies and omissions and it’s quite an effort to determine what titles were actually published each month. In this case, the Mighty Marvel Checklist has three Marvel Magazines that were actually dated March 1980 and completely misses Tomb of Dracula Magazine #4 that hit newsstands that month. In any case, it’s hard to complain too much since the research is fun and reading the old Bullpen Bulletins is always a great sentimental journey. Click on the scan below to see Bullpen Bulletins in high-definition! thanks for posting this. i have a friend who is a curator of all Rom spaceknight appearances and references and i think he will find this posting a good find.